You'll be £18.00 closer to your next £10.00 credit when you purchase Olympic Airways. What's this? I bought this as a present for my mom who says - "As an ex Olympic employee this book brings back memories and makes for a very fun read. I haven't finished it yet but I am definitely enjoying it." This is a magnificent 320 page hardback tribute book to Olympic Airways, Greece's national airline for so many years. Beautifully presented and printed on quality paper, it tells the story from the airline's beginnings up until its demise, with many good quality photographs of the aircraft and personalities, as well as being interspersed with scans of advertising and memorabilia on every page, mostly in colour. Appendixes at the back recall accidents and there is a full fleet listing of every aircraft Olympic operated and what became of them. I wish there were more books of this quality on classic long-serving airlines that lasted this long. Highly recommended. 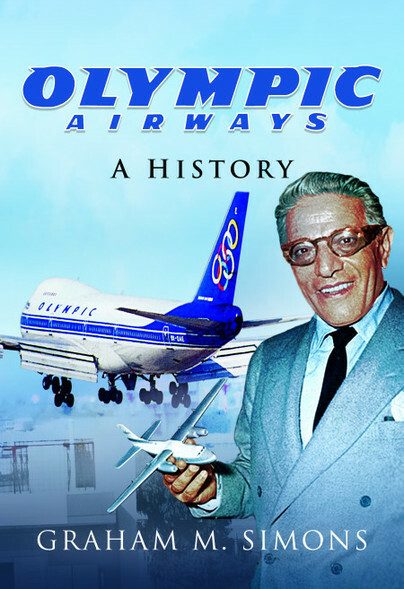 The author Graham M. Simons presents a remarkable and well-researched history of Olympic Airways, one of Europe’s important air carriers, from its launch by oil magnate Aristotle Onassis in 1957 to its demise in 2009. Against the background of Greece’s political life, the evolution of Olympic Airways makes fascinating reading, with rare photos, timetable images, route maps and records of promotional material enhancing this flag carrier’s historical account. A most welcome bonus is offered by the author with a detailed précis of the early years of Greek aviation to the emergence of air carriers including Hellenic Air Communications, Hellenic Airlines, AME and TAE. Rather select photos and timetable images round off the notable record of airlines during the pre-Olympic Airways era, while an overview of the post-OA years covers the successor companies Olympic Air – which took on a scaled-down operating pattern - plus Aegean Airlines. This book is highly recommended as it presents aviation enthusiasts not only with a much-needed Olympic Airways historical account, but also with an overview of Greek civil aviation as a whole.